Arthur Cunningham was born in Piermont, N.Y. in 1928. He was an eclectic composer trained from childhood in both jazz and classical music. His early studies were at the Metropolitan Music School in New York City. While there, he studied classical composition with the school's director, Wallingford Riegger and jazz piano with Teddy Wilson and John Mehegan. Upon graduation, he went to Fisk University, an historic all-Black school in Nashville, Tennessee. His education there was made possible by a fund set up by a group including Kurt Weill, Langston Hughes, Irving Berlin, and Richard Rodgers. At Fisk, he studied classical piano with the well-known accompanist William Duncan Allen, and theory and composition with John Work. He studied further at The Juilliard School with Peter Mennin, Norman Lloyd, and Henry Brant. He earned a Masters Degree from Columbia Teachers College where he received the Distinguished Alumni Award in 1992. His work as a composer took flight in 1968 after a commission from Benjamin Steinberg and the Symphony of the New World. The piece he produced was the dissonant and rhythmically complex Concentrics for orchestra. It was given its premiere at Philharmonic Hall in Lincoln Center, NYC in February 1969. His most prolific period followed with works such as Engrams, Harlem Suite (including Lullabye for a Jazz Baby which was performed by the Alvin Ailey Dance Company), Night Song, Eclatette for solo cello or double bass, The Walton Statement for double bass and orchestra, and many other choral and instrumental pieces. Following a period in the early 1980's where he focused on jazz piano playing, vocal coaching and teaching, he returned to composing in 1986 with a group of short piano pieces. A high point of this late period was his revision of Concentrics for a performance by the New York Philharmonic under Zubin Mehta in 1989. His compositional activities and jazz performing continued until his death. His work with cabaret artist, Kate Davidson (whom he would later marry) was a central creative activity in the last decade of his life. Together, they performed throughout the U.S., Canada, and the Netherlands, and served as U.S. representatives at Expo '92 in Seville, Spain. Further evidence of Cunningham's wide-ranging activities was his work as music coordinator and narrator for the 1989 PBS documentary, The Exiles. He died after a long struggle with cancer in 1997, only a month after a concert in his honor produced by the Rockland Community College African-American History Month Committee. For this concert, he provided spoken commentary on his works before they were played. He then performed, for the final time, with his wife. Harlem Suite was composed for piano in 1970. Arthur Cunningham had been writing piano pieces since the mid-1960's and there is an early version of Lullabye for a Jazz Baby in a workbook of piano pieces from this time. A neat manuscript copy of the piano version of Harlem Suite was found after his death and was dedicated to Natalie Hinderas. Cunningham later was encouraged to recast many of the pieces in choral and orchestral form. After doing so, Theodore Presser Co. published the choral and instrumental works that came to make up the Harlem Suite. More specifically, Lullabye for a Jazz Baby and Sugar Hill were brought together, on the advice of conductor André Kostalanetz, to form the orchestral tone poem Lullabye for a Jazz Baby. This work was recorded on Desto by the Oakland Youth Symphony and featured a young John Faddis playing the jazz trumpet solo. It eventually received over a thousand performances throughout the 1970's and 1980's. 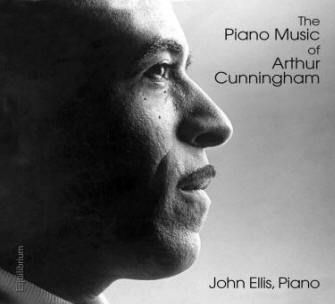 In dramatic contrast to Cunningham's popular-inspired works is his piano piece Engrams(1969) which is freely based on three versions of a tone row. The title is a biological term (referring to the evidence of a stimulus on a protoplasm) and suggests gentle meditations on the past, despite the scherzo-like middle section. Cunningham has written: "I titled this piece Engrams because the sounds are memory tracings...It progresses from the dark of my mind to the light of reality." 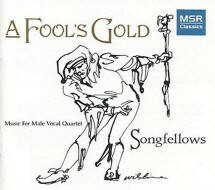 Songfellows is a traditional male vocal quartet (two tenors, baritone, bass) that was originally formed in 1992 from the men’s chorus of the Metropolitan Opera. Founded by Ross Crolius as an adjunct to his career at the Met, the group has performed regularly every season throughout the northeast. While working on my doctoral dissertation on the life and music of Arthur Cunningham, I interviewed the composer from October through December, 1989 at his studio in Nyack, N.Y. I have selected excerpts from the many hours of taped conversations and placed them together. This offers the listener an introduction to the composer's life history, compositional attitudes relating to his jazz and classical studies, and his feelings about the effect of his African-American heritage on his composing. I also chose these excerpts because they show some of the charm, humor and creative intensity of the man who was my piano teacher for four years and became my advisor and friend until his passing in 1997. Adagio, oboe & string orchestra (1954). Ballet (1968) jazz quartet & string quartet. Basis (1968) 4 double basses. Library: Fisk. Beginner's piano book (1964) piano. Contents: 28 pieces. By this dying, flute & violoncello. Concentrics (1968) chamber orchestra. Bryn Mawr: Theodore Presser. Duration: 28:00. Instrumentation: 1111 p Eh bcl, 3331, perc, solo violin, viola & violoncello. Library: Fisk. The cossack (1964) SATB. Text: Arthur Cunningham. Covenant (1972) violoncello & double bass. Nyack NY: Cunningham Music Corporation. Commission: Arthur Davis. Premiere: Arthur Davis. Dialogues (1966) piano & orchestra. 47p. Duration: 5:00. Instrumentation: solo piano, 2221, 2220, timp, perc, strings. Dim du mim (1969) oboe & chamber orchestra. Instrumentation: solo oboe, 2011 bcl, 2220, perc, strings. Library: Fisk. ----- English horn & chamber orchestra. Instrumentation: solo English horn, 2011 bcl, 2220, perc, strings. Library: Fisk. Eclatette (1969) violoncello. The Black perspective in music, v3n2 (May 1975) p226-234. Dedication: William Grant Still. Engrams' (1969) piano. Bryn Mawr: Theodore Presser. 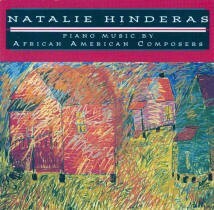 Recorded: Desto DC-7102/3 (Natalie Hinderas, piano). Fragment (1968) brass & percussion. Instrumentation: 3330, timp, perc (5 temple blocks, maracas, claves, tambourine, cymbals, snare drum, bass drum). Library: Fisk. From where I stand (1964; rev. 1950) SATB. Text: Arthur Cunningham. Fruitful trees more fruitful are (1965) 3-part chorus (SSA?). Text: George Herbert. The ginger man (1964; rev. 1955) TTBB. Text: Arthur Cunningham. 2 Haitian play dances (1951) 2 pianos. ----- Harlem is my home; Touch the tree, solo soprano, SATB & piano. Bryn Mawr: Theodore Presser, 1972. 15p. (#321-41002) Commissioned: Dr. Robert Jones for the Laurentian Singers of St. Lawrence University. ----- Hinkty woman, solo tenor, SATB & piano. Bryn Mawr: Theodore Presser, 1972. 24p. (#312-41096) Commissioned: Dr. Robert Jones for the Laurentian Singers of St. Lawrence University. Library: Library of Congess. ----- Lenox, narrator, SATB & piano. Bryn Mawr: Theodore Presser, 1972. 6p. (#312-20982) Commissioned: Dr. Robert Jones for the Laurentian Singers of St. Lawrence University. ----- A little love; a salvation piece, solo soprano, baritone, SATB & piano, with options electric bass & drums. Bryn Mawr: Theodore Presser, 1972. 19p. (#312-40965) Commissioned: Dr. Robert Jones for the Laurentian Singers of St. Lawrence University. Library: Library of Congress. ----- Munday man, SATB & piano. Bryn Mawr: Theodore Presser, 1972. 8p. (#312-40983) Commissioned: Dr. Robert Jones for the Laurentian Singers of St. Lawrence University. Library: Library of Congress. ----- Pataditas; Little kicks, solo piano & orchestra. Bryn Mawr: Theodore Presser. Duration: 5:00. Instrumentation: solo piano, 2231, 3330, timp, perc, strings. ----- Sunday in de evenin', SSAA & piano. Bryn Mawr: Theodore Presser, 1972. 6p. (#312-40968) Commissioned: Dr. Robert Jones for the Laurentian Singers of St. Lawrence University. Library: Library of Congress. ----- World goin' down, SATB. Bryn Mawr: Theodore Presser, 1972. 11p. (#312-40967) Commissioned: Dr. Robert Jones for the Laurentian Singers of St. Lawrence University. He met her at the Dolphin; Holiday (1963), SATB with piano reduction. New York: Remick Music Corporation, 1964. 10p. (Secular choral music, R 3457; #4423-9) Text: Arthur Cunningham. LIBRARY: BRITISH LIBRARY. His natural grace (1969), one-act opera. Text: Arthur Cunningham. House by the sea (1966), one-act opera. Library: Fisk (libretto). Hymn of our Lord at the Last Supper (1962) SATB. Text: Acts of St. John. In the year seventeen, SATB. 2 Inventions (1952) 2 double basses. Into my heart (1964) SATB. Text: A. E. Housman. Jabberwocky (1960) high voice & piano. Text: Lewis Carrol. Jill Ellen (1975) guitar, violin, viola, and violoncello. ----- Honey Brown, TTBB. Byrn Mawr: Theodore Presser, 1972. 8p. (#312-40969) Dedication: Sharron Miller. ----- 2 Prayers: Lord, look down; We gonna make it, SATB. Bryn Mawr: Theodore Presser, 1972. 8p. (#312-40966) Dedication: Fisk Jubilee Singers, on their 100th anniversary. -----Timber, SATB. Bryn Mawr: Theodore Presser, 1972. 5p. (#312-40970) Text: Arthur Cunningham. The leaden eyed (1956), high voice & piano. Text: Vachel Lindsay. Let the day begin (1964) SA. Lights across the Hudson, orchestra. Litany for the flower children (1972), SATB & orchestra. Nyack: Cunningham Music Corporation. Premiere: 4 August 1972; Stanford CA; Stanford University Summer Session Chorus; members of the San Francisco Symphony Orchestra; Arthur Cunningham, conductor. The loveliest of trees (1964), SATB. Text: A. E. Housman. Lovey lovey (1968), mini-opera 1 act. Text: Arthur Cunningham. Original title: His natural grace. Library: Fisk (libretto). Minakesh (1969) violoncello & string orchestra. ----- The garden of Phobos, SATB. Text: "Life sounds." Library: Fisk. Night song (1973) SATB & orchestra. Bryn Mawr: Theodore Presser, 1974. Text: (1) in Swahili; (2) in Gullah; (3) in English. Duration: 60:00. Commission: Cheney State College. Octet, percussion (1968). Instrumentation: snare drum, 5 temple blocks, 3 timpani, 4 timbales, suspended cymbal, maracas, giro, tambourine, claves, bass drum. Library: Fisk. Organ prelude and hymn on Lead us still and guide us (1965) SATB. Text: Arthur Cunningham. Ostrich feathers (1964), a musical play in two acts for children. Bryn Mawr: Theodore Presser. Text: Barbara Brenner. Duration: 60:00. Premiere? : 1974; California State College, Dominguez Hills. Pale moons rise (1955) SATB. Text: Arthur Cunningham. Patsy Patch and Susan's dream (1963), musical comedy for very young children. Text: Arthur Cunningham. Perimeters (1965) flute, clarinet, vibraphone & double bass. The prince (1971) medium voice & orchestra. Bryn Mawr: Theodore Presser. Duration: 25:00. Instrumentation: 2222, 2221, timp, perc, strings. Premiere (excerpts): 3 April 1973; Detroit Symphony Orchestra; Paul Freeman, conductor. Prometheus (1967) double bass or piano & orchestra. Ring out, wild bells (1965) SATB. Text: Alfred Lord Tennyson. Septet, woodwinds (1968). Instrumentation: piccolo, flute, oboe, English horn, clarinet, bass clarinet, bassoon. Library: Fisk. Serenade (1955) violoncello & piano. Sing, children, sing (1964) SATB. Text: Arthur Cunningham. Song of songs (1951) high voice & piano. Text: Wilfred Owen. Songs for A midsummer night's dream (1967) high voice & piano. Contents: (1) Purple grapes, green figs, and dewberries; (2) Thisby dying; (3) I do wander everywhere; (4) Loves and madmen. Text: William Shakespeare. Sugarhill (1969) violoncello, 2 double basses & piano. Sun bird (1974) low voice, guitar & orchestra. Duration: 15:00. Premiere: March 1975; Newport News. Sunday stone, SATB & piano or organ. Bryn Mawr: Theodore Presser, 1974. 12p. (Choir loft series; #312-41053) Text: Arthur Cunningham. Duration: 4:00. Dedication: David Liebler. Premiere: St. Lawrence University, Canton NY. Theatre piece (1966) orchestra. Nyack: June 1966. 56p. Instrumentation: 2222 p Eh (bcl), 3331, timp, perc, harp, strings. Library: Lerma. Then the cricket sings (1964; rev. 1957) SATB. This by dying (1968) flute & violoncello. Trio, flute, bassoon & viola (1952). Trio, violin, viola, violoncello (1968). Trinities (1968) violoncello & 2 double basses. Turning of the babies in the bed (1951) medium voice & piano. Text: Paul Laurence Dunbar. Violet and phospher (1964) ==WHAT FOR?. Text: Arthur Cunningham. Library: Library of Congress (holograph). The Walton statement, op. 7 (1972) double bass & orchestra. Bryn Mawr: Theodore Presser. Duration: 16:00. Contents: (1) Yesterday; (2) Tomorrow; (3) Today. Instrumentation: 2220, 3330, timp, harp, strings. Dedication: Ortiz Walton. The west wind (1962) SATB. Text: John Masefield. When I was one and twenty (1963) SATB. Text: A. E. Houseman. With rue my heart is laden (1964) SATB. Text: A. E. Houseman.